It was used to position the linear guide attached to the narrow part. Because it is difficult to measure with a normal size dial gauge, I purchased it because I needed a small thing. Both accuracy and usability were satisfying with this request. This review is about item#9154101. It is inferior to a certain maker item in firm making. If the proof certificate is not particularly necessary, I think that it is a good product because it is inexpensive. It was planned to be used on a lathe. I had planned to use it with a combination of this small dial gauge with "Monotaro Mini Magnet Base", which was purchased previously, order code: 08597215 product number: MB - 0037, but neither item was attached with connection fixing screws. TRUSCO If you do not buy from the maintenance parts for the magnet base, it will not be used. Order code: 37313945 Part name: Tightening knob Although removing the tightening knob attached to the normal size monotaro first magnet base did not cause any problem in the installation test, there is only one tightening knob so there is no meaning to purchase it. If it does not become usable, a normal size monaural magnet base and a dial gauge are sufficient. 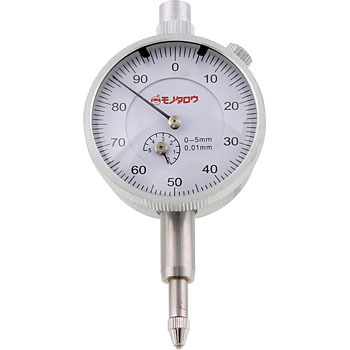 Although the size and accuracy are general-purpose dial gauges, because the price is low, it is suitable for the site. Used in combination with a mini magnet base. I think that there is a little weight (slight astringency) in the movement of the axis, but it can be used without any problem for adjustment. I think that it is a good product for low prices. This review is about item#09154101. I purchased it because I had to change the shaft diameter of ready made pulley. Because the pulley is used at high speed rotation, I wanted to center it as accurately as possible. Conventionally the center of the cutting tool was brought close to the center, but in the miniature lathe it was limited to about 0.2 mm. So, I looked for a dial gauge, so I bought it because it was affordable. Just hold the pulley in the chuck, rotate the chuck by applying this product, and tighten the nail so that the maximum swing of the pointer is halved, it is as easy as 25μ (the pulling accuracy is like this level) I could push it. Since it is not used frequently at the hobby level, I do not feel dissatisfaction. Product inspection, lathe, centering of milling machine etc. It was able to be used normally. It can be small. It is still better if it gets a little thinner as it has thickness. I think that it is not inferior to a certain famous manufacturer. When shaving items by attaching jigs to the lathe, first use them for shaking jigs. A regular dial gauge is a paper curtain container, but this item enters the platikik case and I bought it because it is a reasonable unit price in a compact design.